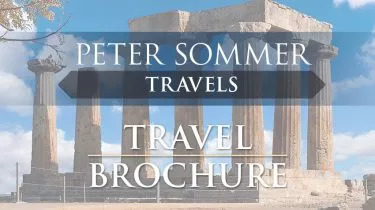 As well as travel writing Peter also personally leads a number of our escorted tours in Turkey each year. Archaeological tours can range from bargain basement coach trips around the ruins of Greece to exotic adventures around the Mayan sites of Guatemala. Such cultural trips are growing ever more popular. Many travellers no longer want a simple beach holiday, instead they want to be inspired – to see some of the wonders of the ancient world, explore a culture’s past, and find out a bit more about their ancestors and themselves. Here’s a few top tips when looking for an archaeological holiday. They can make or break your trip so find out a bit about them. Some local guides are excellent but many have no real training and simply follow a dull repetitive spiel. Academics may be the leading light in their profession, but that doesn’t mean they are effective, enthusiastic, and passionate communicators. If the tour guide is all these things and knowledgeable to boot, you’re probably in for a marvellous trip. Some tours try to cover too much ground and can be quite exhausting. Is it a case of long drive, out of the coach, into the site, back on the coach…a veritable check list of ancient landmarks that customers can tick off? Is there time to pause, take in the scenery, and soak up the atmosphere? Look for an itinerary that has been carefully thought out and that doesn’t try and cram in too many sites and too much driving. Cheap might mean large group sizes where you’re just one in a large herd ferried around like cattle, barely able to hear the tour guide. If this is the case, it’s unlikely that the guide will have the time or energy to listen to you, talk to you personally, or make you feel special in any way. I think 16 maximum seems to work best. Make sure that they are reputable and that they comply with the Package Travel, Package Holidays, and Package Tours Regulations 1992, which ensures they offer protection for customers’ money. What’s the company’s history? Some of the bigger travel companies, used to dealing with large numbers, now run cheap ‘cultural’ tours. Compare what these trips have to offer with those run by smaller companies that may be more passionate about archaeology and experienced with escorted tours. The old adage is often true, so it’s not necessarily best going for the cheapest option. Cheaper packages often use big faceless hotels and involve charter flights with departures in the middle of the night. Take the time to choose the right archaeological tour for you. Many travel companies offering archaeological tours are true specialists, so talk to them. Then sign up for what will almost certainly be a unique and exceptional holiday. Ephesus, Turkey. The Roman capital of Asia, and one of the best preserved classical cities in the Mediterrean. The site is magnificent – marble streets, agoras, villas, a theatre for 28,000 and an extraordinary library. The Pyramids, Egypt. Perhaps the most epic testament to the ingenuity, imagination, and sophistication of ancient cultures. A simply breathtaking set of tombs dating back some 4,500 years. Great Wall of China. Over 4,000 miles long, this fortified perimeter is an astonishing piece of work conceived on such an epic scale as to be almost unimaginable. Through desert and mountain it marches on unstoppable, a mindblowing reminder of China’s cultural supremacy for much of the first millennium after Christ. The Bardo Museum, Tunis, Tunisia. Not a singular building of wonder but an extraordinary collection of Roman mosaics, perhaps the finest in the world. The museum’s walls are simply cloaked with the mosaics, making for an inspirational, beautiful,and spellbinding display. The churches of Lalibela, Ethiopia. While most architectural wonders soar upwards towards the heavens, these spectacular churches are quite literally hollowed out of the ground. About 800 years old they are still living breathing monuments at the centre of colourful religious ceremonies and processions. The statues on Easter Island. I’ve not yet managed to get there myself, but for something far removed from the ancient Mediterrean, then the astonishing and atmospheric heads on Easter Island have to rank as one of my biggest archaeological must-sees. Teotihuacan, Mexico. The first great metropolis of the New World, named by the Aztecs ‘Place of the Gods’. A meticulously planned city beginning about 200BC with a grid of streets and buildings overshadowed by the monstrous Pyramid of the Sun. Click here for this year’s schedule of escorted archaeological tours. This was our fourth Peter Sommer trip (we just have to keep coming back) and this one certainly did not disappoint. As before, we found the combination of beautiful scenery, history, culture, good food and good company impossible to resist! Our lovely guide, Ivana, made everything come alive for us and the captain and crew could not have done more.